Brenda Miley and her team from Bondi Beach’s own Lets Go Surfing have taken out the prestigious Gold award for Adventure Tourism in the recent 2017 NSW Tourism Awards. Over 500 guests attended the gala event held at the International Convention Centre, Darling Harbour on Thursday 16 November 2017. The awards celebrated the industry success of 100 outstanding finalists from across the State of NSW. 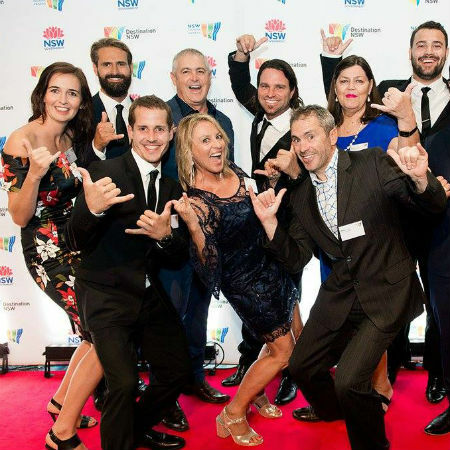 This year’s win see’s Lets Go Surfing back to back winners and places the locally loved and internationally famous surf school into contention for a hat-trick and official entry into the NSW Tourism Awards Hall of Fame. Lets Go Surfing founded in 1995, continue today as a community based surf school teaching local kids, adults and community groups to surf and were initially advised by the tourism industry that; “surfing is not a tourism product”, However, today Lets Go Surfing is showcased by Destination NSW and Tourism Australia as one of the 3 Sydney Icons in key Australian international tourism markets alongside The Sydney Opera House, Sydney Harbour Bridge climb and Lets Go Surfing Bondi Beach. Lets Go Surfing have pioneered surfing in the tourism industry, providing local employment and training hundreds of staff and contributing to the local visitor economy. Now in their 27th year, the NSW Tourism Awards celebrate and acknowledge tourism businesses that have demonstrated outstanding achievement and success throughout the year. The Awards are a submission and inspection-based program and provide the opportunity to publicly recognise and showcase the State’s finest tourism operators. The Awards have 29 categories across the industry spectrum – attractions, festivals and events, ecotourism, tour and transport operators, marketing and accommodation and outstanding contribution from an individual. Lets Go Surfing’s win provides the opportunity to progress as finalist in the upcoming 2017 Qantas Australian Tourism Awards.